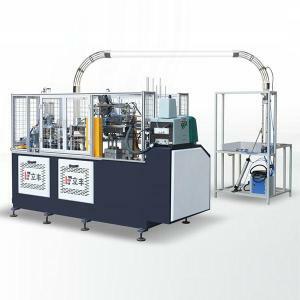 ZB-12A paper cup machine is an automatic, multi-working station machine. Our machine produces single coated paper cups through the procedure of automatic paper feeding, sealing, oiling, bottom punching, heating, curling and cup discharge. Our one-sided PE paper cups are popular for coffee, ice cream, etc. 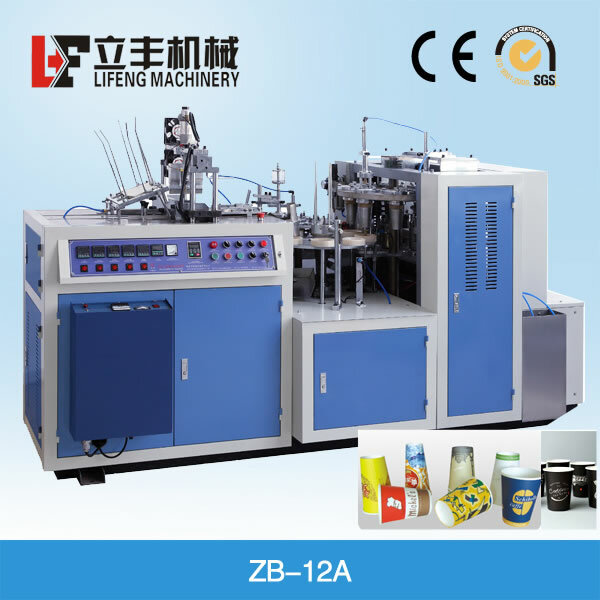 ZB-12A paper cup machine makes single coated and double coated paper cups. 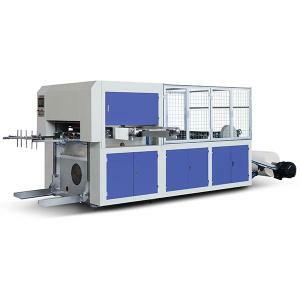 Compared with the original ZB-12A paper cup machine, the ZB-12A is equipped with ultrasonic welding. 1. Our paper cup machine (double PE coated paper) uses an imported ultrasonic hot-press system and does not damage the printing on the paper cup. It produces a paper cup with neat and smooth surface. 2. Equipped with air-suction paper feeding mechanism, container wall forming, adhering, paper-lip forming, etc. 3. Optically controlled non contact switch automatically controls the machine which ensures the safety of the machine and operator. 4. Our paper cup machine (double PE coated paper) has a micro-computer controlled inverter which enables equipment to realize speed regulation. 5. It has been certified by CE approval. 6. 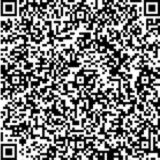 Utilizes a photoelectric tracing system. 7. Our paper cup machine (double PE coated paper) is equipped with high quality bearings. 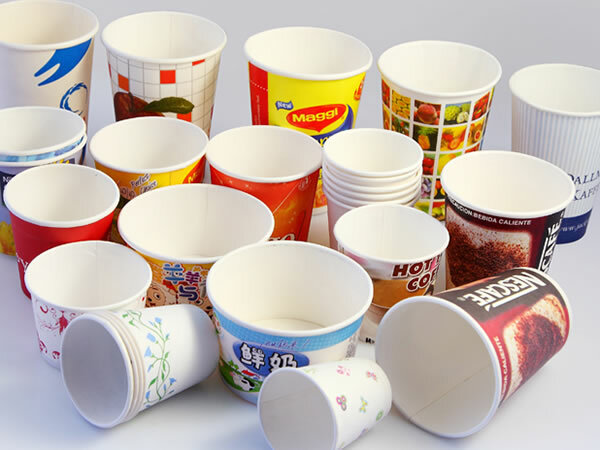 The ZB-12A paper cup machine (double PE coated paper) is used to make different types of paper cup containers, i.e., disposable paper cups commonly used in all kinds of public places. 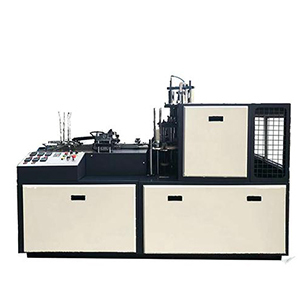 The frame of paper cup machine (double PE coated paper) is made of metal and the body is made of steel. Maintenance on the ZB-12A paper cup machine (double PE coated paper) should only be carried out under supervision. Strict attention should be given while the machine is in operation and the shield is removed. 1. Clean materials and accessory materials. 2. Attention should be paid to the sanitation and cleanliness of the machine. A fixed scheduled should be maintained to clear and wipe down the machine. Keep greasy dirt away from the paper, die and roller. The paper cup machine (double PE coated paper) should be located away from paper scraps, dust accumulation or plastic rolling. 3. Glycerol is used to lubricate the entire machine. A fixed schedule should be maintained to clean lubricated places and lubricate them with glycerol. All the machines are delivered in a wooden case. A guide book is included to assist with the installation and machine adjustment process and help solve any problems that may be encountered. 1. The ZB-12A paper cup machine (double PE coated paper) is adjusted one week prior to delivery to make sure our Lifeng machine is in perfect condition. 2. Technicians are available to guide the installation and adjust the machine at the buyer's factory. This service would be at the buyer's expense and include the technician's salary, transportation, accommodations, consultation, etc. as well as $100 USD per diem for the technician. 3. 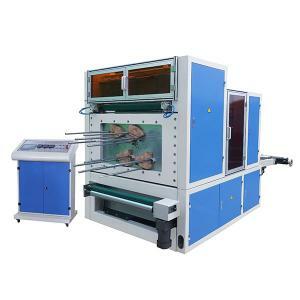 Free training is available and ongoing for the buyer until he fully understands the operation of our Lifeng paper cup machine (double PE coated paper). The buyer would be responsible for airfare and accommodations expenses. 4. Lifeng provides the consumable spare parts at no cost for one year. 1. Lifeng paper cup machine (double PE coated paper) offers a one year warranty from the shipment date. 2. The Lifeng warranty is not applicable to parts requiring normal replacement. 3. Lifeng is not responsible for any damage caused by misuse, improper handling, negligent maintenance, intentional injury or other damages.